CN! Store Spotlight Edition 2: Cascadian Craft — CascadiaNow! Welcome to the second edition of our CascadiaNow! Store Spotlight! We’ve created this series in order to highlight the awesome partnerships we’ve made at CN! through our online store. All the items in our store support West Coast businesses in some way in order to promote bioregionalism through autonomy of commerce. This week: Cascadian Craft. You've probably come across this Olympia-based apparel shop at one of the many street markets throughout the region. Featuring many original designs, Cascadian Craft boasts a number of hand-printed (with environmentally friendly water-based inks!) shirts and bandanas. The shop also has a really neat donation program called First Five, where 5% of all sales are contributed to environmental organizations. This year, donations helped fund Washington Trails Association, The Nature Conservancy, and Big City Mountaineers. "After taking shrapnel from a rocket-propelled grenade in Iraq in December 2004, I was recovering at a field hospital when I first heard about the then-unofficial Pacific Northwest Trail (PNT) from the continental divide in Montana to the tip of the Olympic Peninsula. I had plenty of time at the base’s Internet cafe to mentally escape my situation by researching and planning a PNT thru-hike as soon as I could get out of Iraq and out of the Army. Within weeks of my discharge I found myself at the amtrak station in East Glacier, Montana, with no backpacking experience, too much stuff in my pack, and more than a thousand lonely miles between me and the Pacific Ocean. The experience of crossing the incredibly diverse landscapes, day after day, for an entire summer, and in almost total solitude opened my eyes and transformed me completely. Thirteen years later, I am still profoundly grateful for the healing, friendships and inspiration I find in the wild places of this special corner of the world. These days I share the trail with my dog Rocky, who likes frolicking in alpine snow drifts, and I print in my home in Olympia, Washington." I think we can all agree with Justin that there is something truly special about the Cascadia bioregion. Thanks for sharing, Justin! We are so excited to begin our partnership with such a wonderful individual and shop. 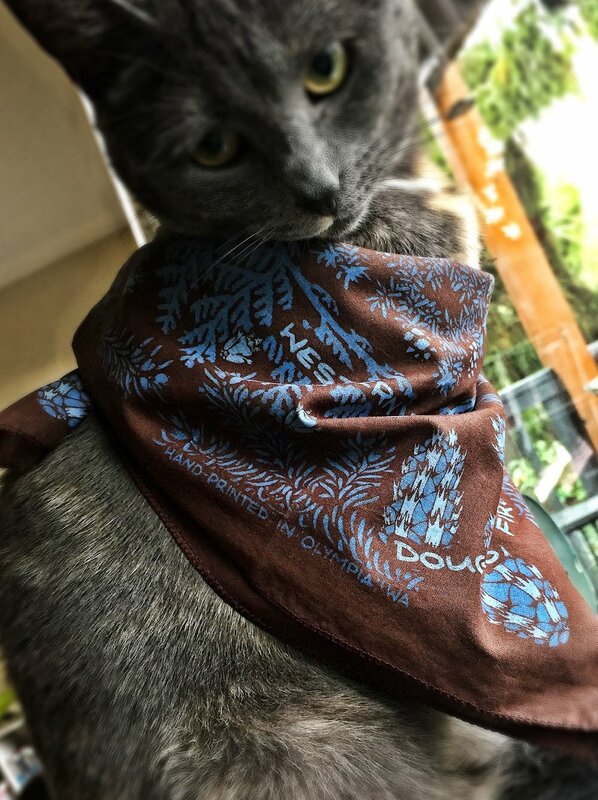 You can find Cascadian Craft's Tree Identification Bandanas here (kitty friendly, as shown above) and Doug Fir Tees here.